Creating beautiful spaces with flea market finds and easy, inexpensive DIY. Get all the latest here! Colder weather tends to make us head to the heart of the home. As we create soups, stews, and other comfort foods we often want to surround ourselves with warmth. 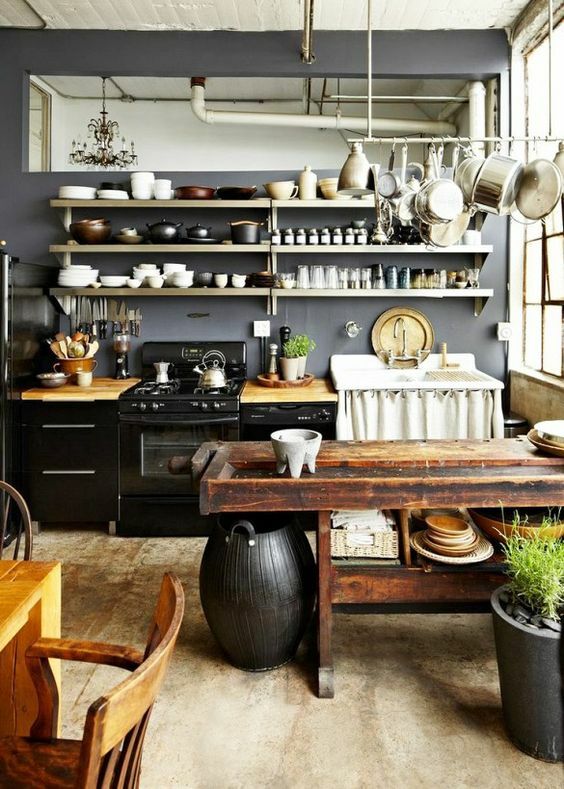 Here is How To Create A Cozy Kitchen. 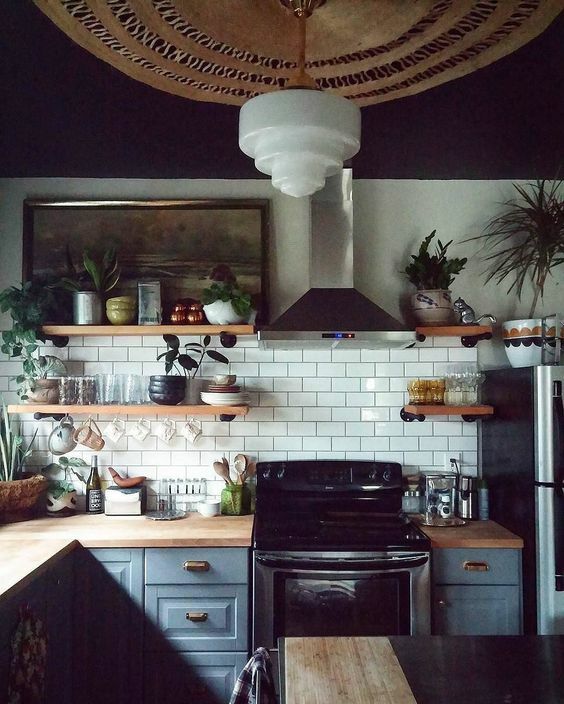 There are several ways you can layer a kitchen in coziness. The warmth of wood is one surefire way. Although, not all of us are lucky enough to have elements such as wooden beams and open shelving. 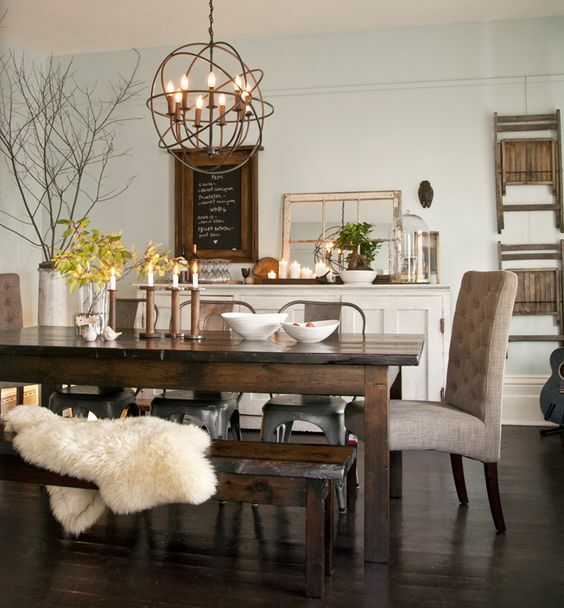 But a wooden table can certainly add cozy charm to a room. 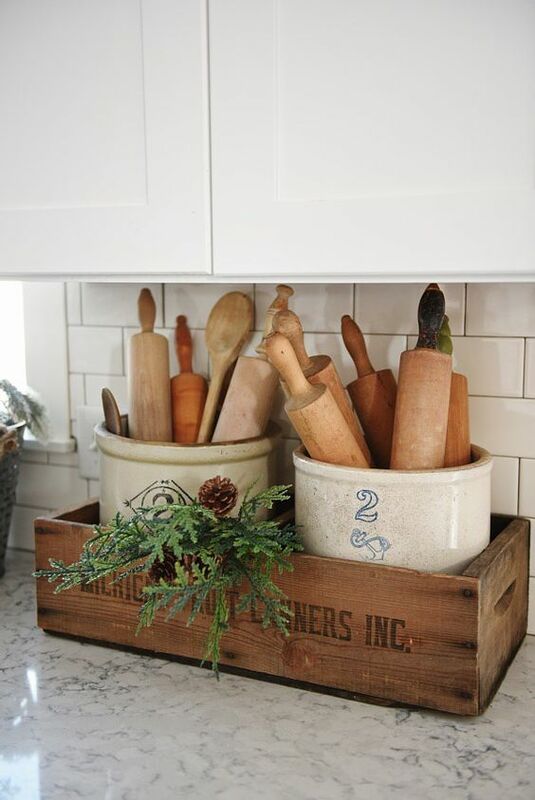 On a smaller scale, a kitchen corner can become truly cozy by stacking old packing crates. Everyone needs a few cutting boards. Why not find a few lovely selections to group together? If you have a collection of wooden rolling pins show them off! Or even showcasing your wooden spoons can add a simple touch of warmth. Warm metallic accents such as copper and brass evoke lovely warmth. 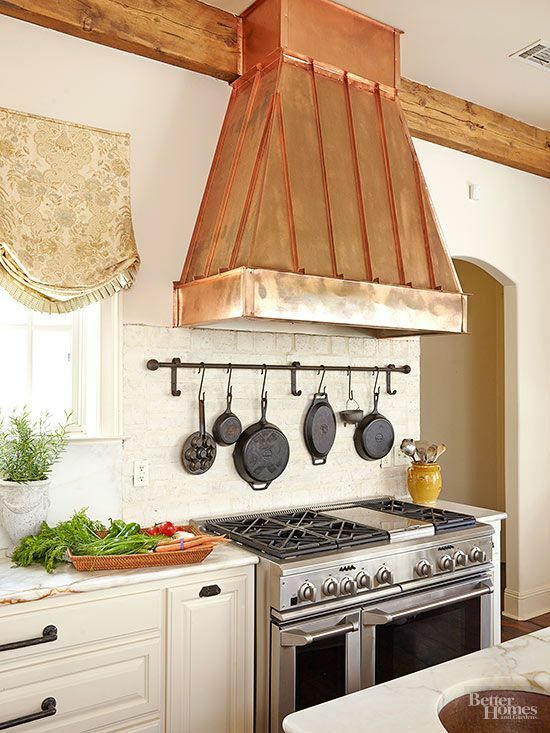 This copper range hood is stunning. It adds character and warmth. 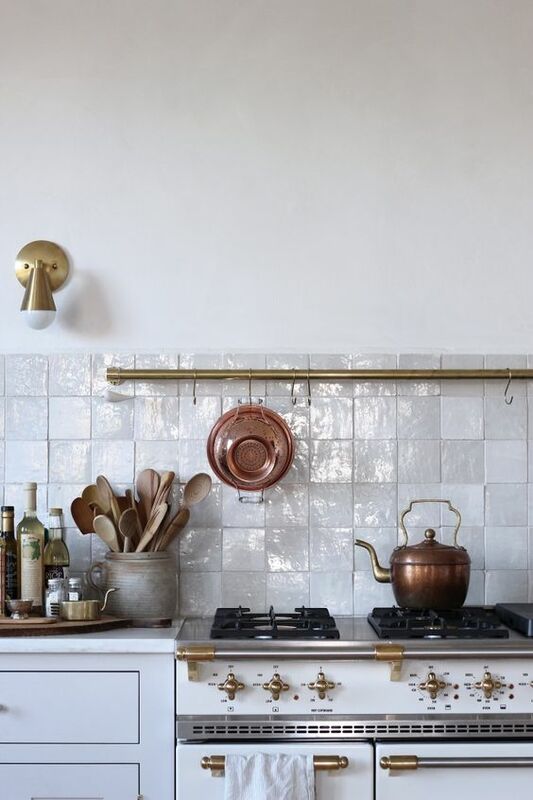 If you have a smalle budget, copper pots can often be found at thrift stores and estate sales for just a few dollars. Even simple brass measuring cups and canisters can add a lovely glow. Don’t underestimate the pleasant charm of a single copper kettle. This is also a great example that various metal finishes can indeed be mixed! 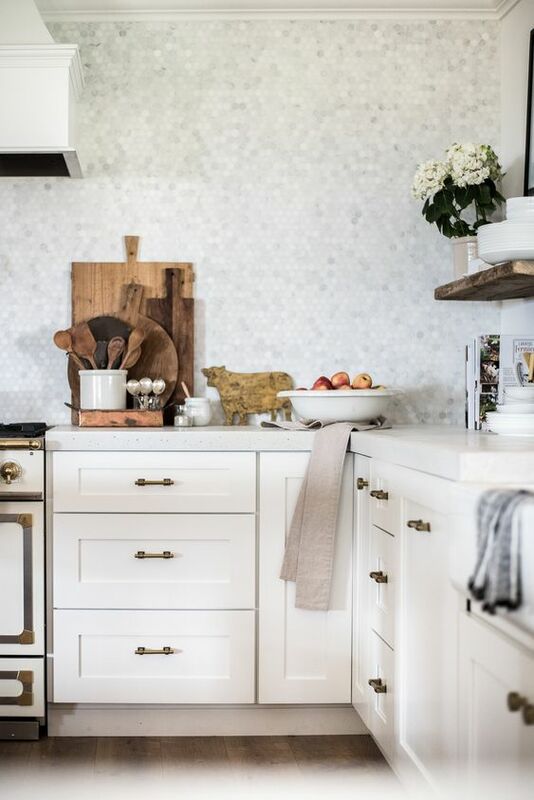 White kitchens are currently in vogue as they photograph so beautifully. But they can also look a little cold. Imagine if this kitchen did not have the area rug to amp up the snug factor. 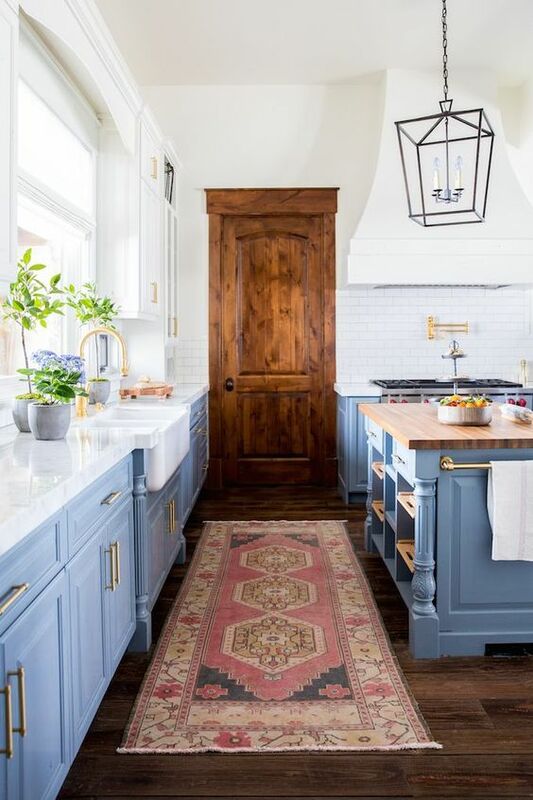 Cool blue cabinets are paired with a toasty pink rug to create warmth. Wood and brass accents also keep the space from becoming too chilly. Don’t want to risk tripping on a rug? Center it under a table or island. TIP: Fine art in the kitchen is always a “YES!” in my book. In this image, a round raffia area rug adds warmth and texture to the ceiling. A warm color palette can instantly add in the cozy factor like these balmy teal cabinets with brass accents. Temporary color can easily be added via artwork, linens, and accessories. Even just creating a cozy kitchen tablescape can leave you glowing. 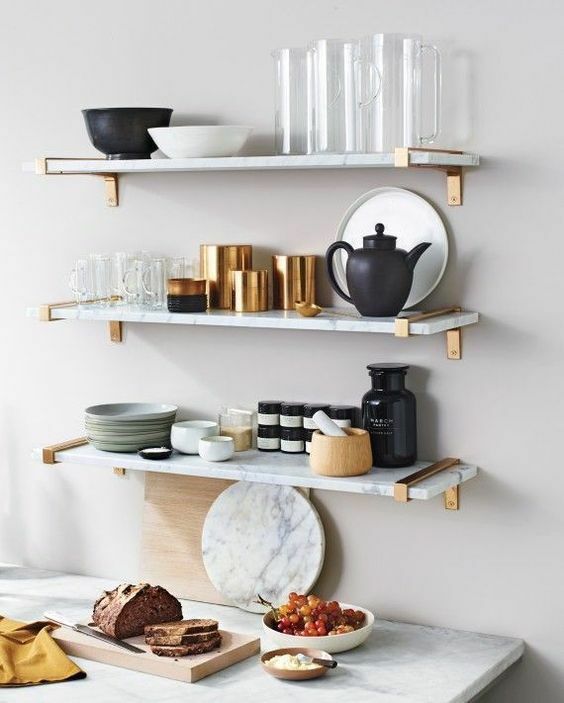 Open shelving that showcases only white and glass dishware can be icy. The secret is to layer in warm accent pieces. 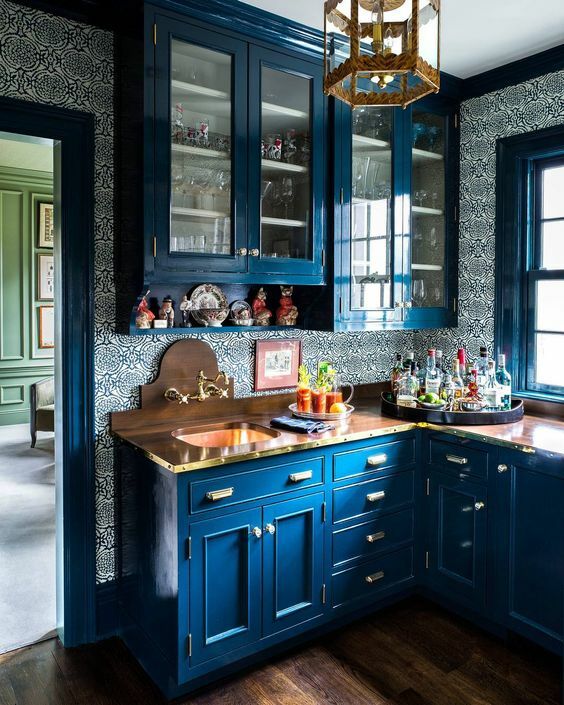 This kitchen features a predominately cool color palette. But the addition of the yellow confit pot, wooden accents, and potted herbs save it from becoming a frozen tundra. 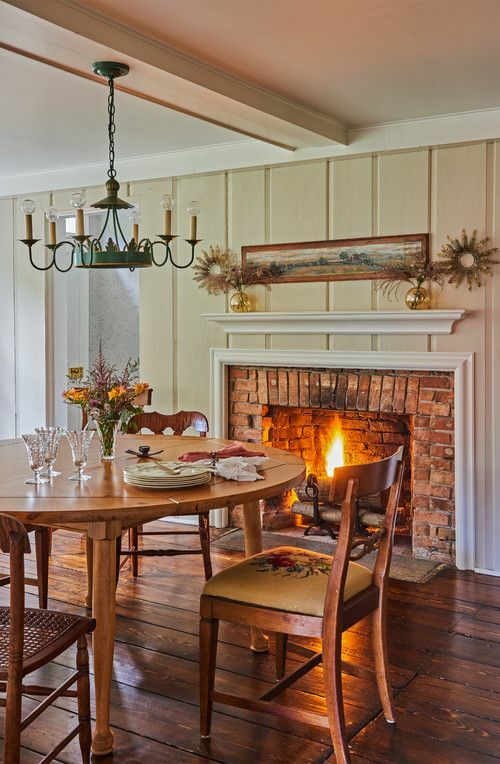 Who wouldn’t want a roaring fire in their breakfast nook! No fireplace? 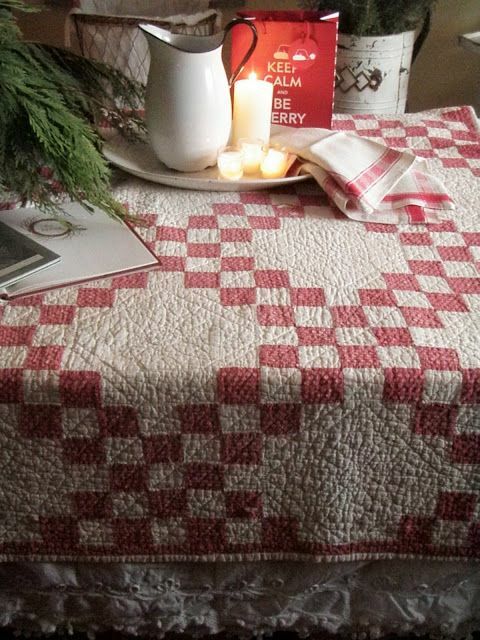 Try adding in antiques such as tole chandeliers and granny’s needlepoint to provide classically cozy touches. If you have a built-in banquette add in pillows that bring the heat. 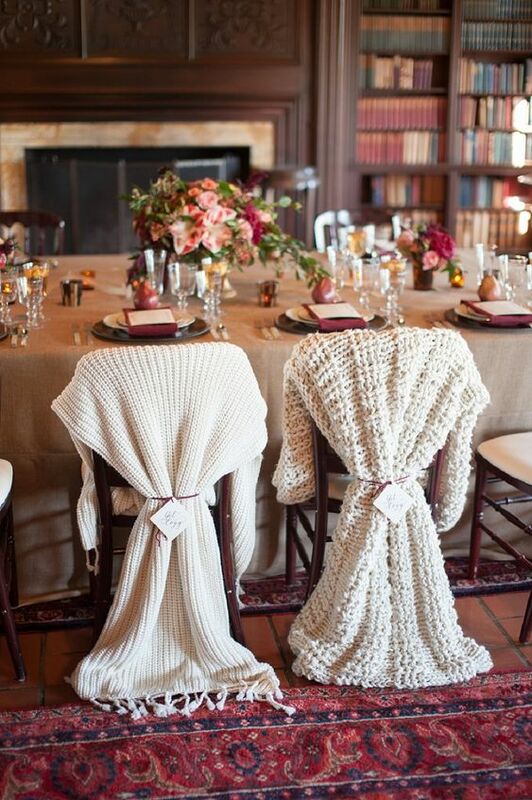 Hosting a dinner party and know a few of your guests are always cold? Little details make all the difference and warm hearts in the process. Never underestimate the power of a faux fur throw to warm up a bench or metal chair. But remember to use fur only as an appropriate accent in kitchen and dining areas. My kitchen is definitely ready for a makeover. Probably more makeover than my budget allows. But new floors and counters would help a lot! I guess we’ll just have to go with reducing the clutter! Welcome back, Laura. Your trip sounded harrowing. What a gorgeous post. I don’t know which beautiful kitchen I like best. I just love all these charming and yes, cozy images, Laura! I was happy to see that I already have many of these elements in my kitchen, and would love to add some of the others you’ve shown. I can always count on you for a good chuckle, and that last image was a hoot! 😀 My mom has a cat, and she would get a kick out of this. Thanks for sharing, Laura, and have a great day. I love the teal cabinets. We live in a home built in the 90’s with the blonde oak cabinets – would dearly love to paint them. I did recently move our small kitchen table in front of the fireplace. It looks nice and cozy there! Where the table would normally sit has been made into a reading nook. What trip? I can see that I missed that and will go back to read ab out your trip. Though I don’t think it is particularly practical, I love the oriental carpets in the kitchen. 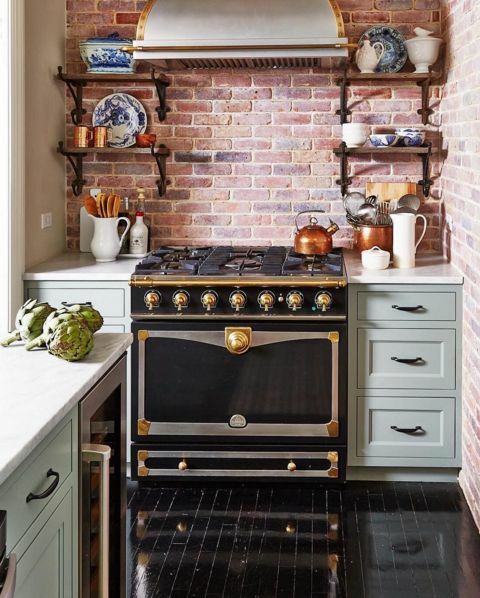 The brick backsplash behind the stove would be pretty hard to keep clean but we can always learn something from interior designer photos. What I got out of these is that wood, red, yellow and fire are cozy. What I wouldn’t give to have a real wood burning fireplace in the kitchen. I enjoyed these, Laura. And thanks for the great laugh. Thought provoking post with great ideas. I’m ready for some changes in my kitchen. I’m going back for a second read. ALWAYS enjoy all the beautiful pictures you post – just choosing different elements of some of the photos would be fun to carry out in our homes. And…..SO like a cat. 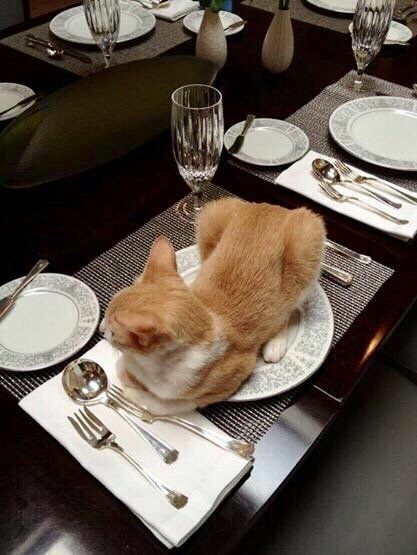 I’m sure he (or she) thought the table was set just for him/her. LOL Thank you for posting!!! Love the ideas! Some of which I do incoporate already, which made me happy to see. Hope the new year is treating you right and you are staying WARM!!!! 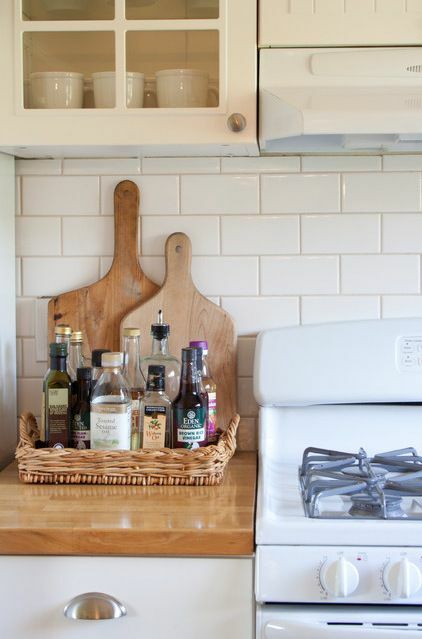 I am so excited to see all of the cute storage ideas in some of the cute, cozy kitchens. 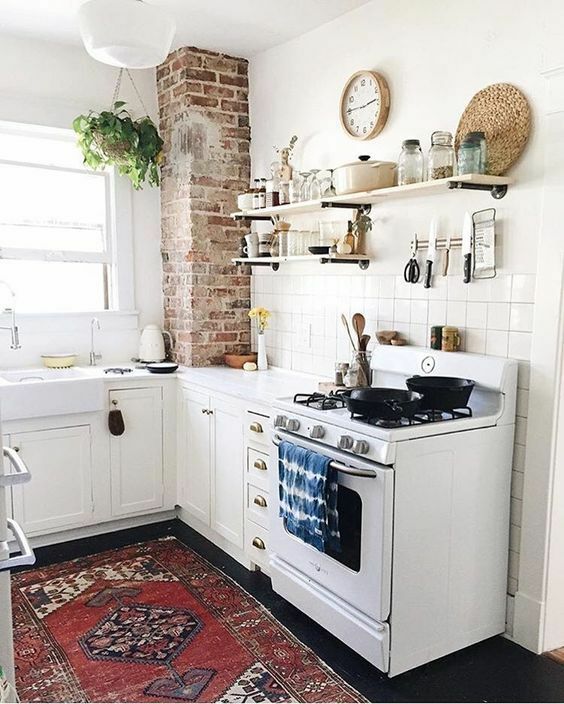 Something as simple as a throw rug can made such a wonderful difference in decorating a kitchen. 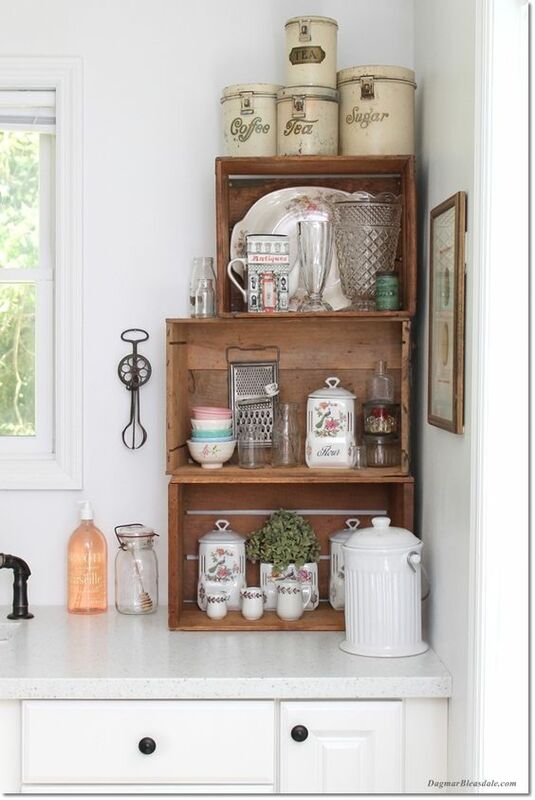 I would love to try the open shelving idea, but I have no where in the house to try it. Visiting from Share Your Style link party! Any picture with brick in it gets my immediate attention. It just really draws me in. And the cat sitting on a plste–absolutely have been there ! Thank you for the charming ideas. They look so inviting. I must share. I would be very happy with any one of these kitchens. Love the cat on the dinner plate. Regardless of who, when where and what’s going on, they rule the world, don’t they. 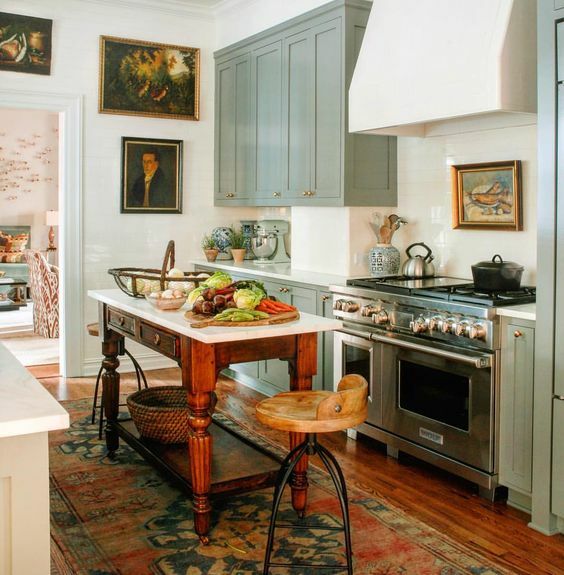 You featured some wonderful ideas for cozy kitchens and have given me a lot of inspiration. Thanks for this post. I think wood in a kitchen makes all the difference. Some of those beautiful all white kitchens we see everywhere would look so much more charming and welcoming with a little bit of wood. Those people should read your post! Loved the post. Pinned a couple of pics! Aww, I love your humor at the end Laura! All the photos are stunning! 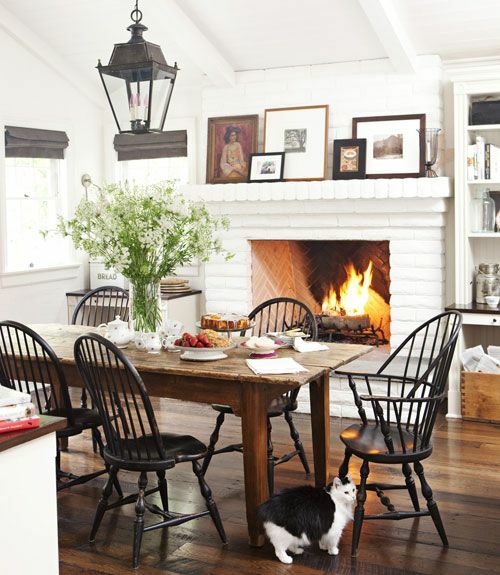 I would love to have a fireplace in the kitchen, but lots of photos here to inspire and get you thinking about what you can do in your space. It’s a lovely round-up. 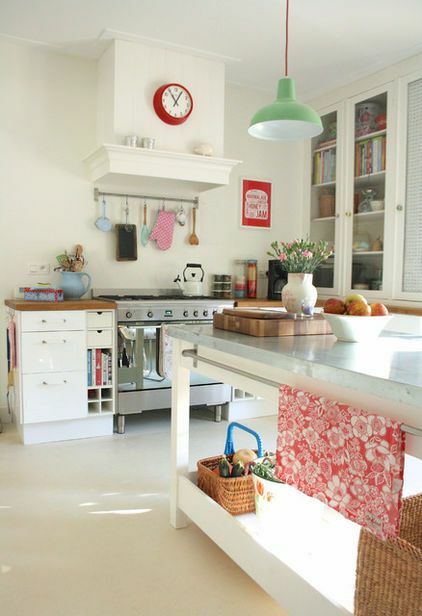 Oh my gosh I love so many of those kitchens! It’s nice to daydream…..a fireplace would be heaven:) Thanks for sharing at Vintage Charm! I do love a cozy kitchen! So many great ideas Laura. Thanks for sharing them with SYC. I am gasping for breath!!! I will be featuring this post tomorrow at TFT!